The DDRC-88A and DDRC-88D are powerful audio processor able to provide room correction AND flexible active speaker processing under one box. The DDRC-88BM plugin includes miniDSP's flexible and powerful signal processing functionality on each output channel, along with full signal routing/mixing. This can be used to implement active speakers. 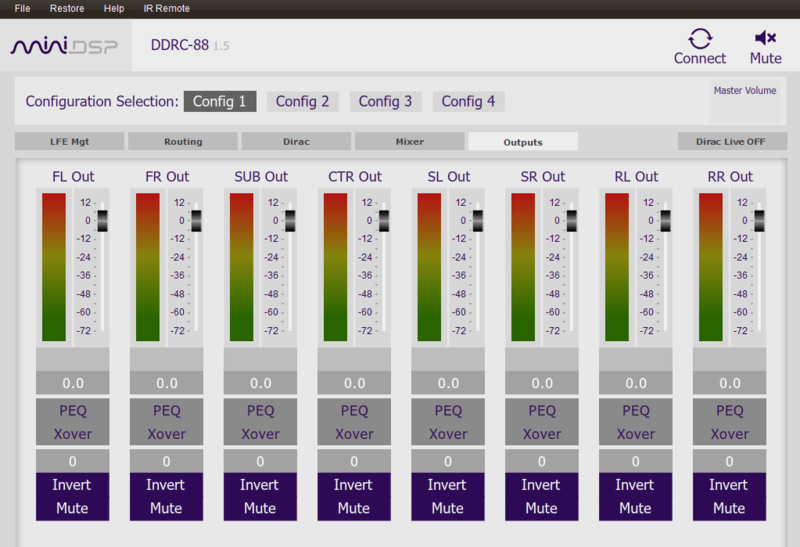 Note: configuring the DDRC-88BM plugin for active speakers should be done before performing your Dirac Live calibration. Figure 1 illustrates a multichannel active system in which four channels from an A/V receiver or processor are input into the DDRC-88A: left front, right front, center, and LFE/subwoofer. The front and center speakers are active two-ways. A great many other combinations are also possible – with a single DDRC-88A you can implement four two-way active speakers, two four-ways, or two three-ways and a two-way. You can even add on multiple subwoofers and optimize them as described in Optimizing multiple subwoofers with the DDRC-88BM and Multi-Sub Optimizer. For more complex systems, multiple DDRC-88A units can be used. Note: when connecting power amplifiers directly to speaker drivers, a protection capacitor in series with each tweeter is strongly recommended. If you are starting from scratch, you will need to select the drivers for your speakers. There are literally hundreds of drivers available for DIY use at all price levels, so it's impossible to give specific recommendations here. Peruse the online forums to see what others are using and to ask for recommendations for your particular project. The output from Dirac Live channel 1 is sent to output channels 1 and 2. These will be used for the woofer and tweeter of the left front speaker, as indicated by the labels at the top. (The names are changed on the Outputs tab.) The right and center speakers are set up in the same way. The two remaining output channels are used to drive two subwoofers. You will now need to measure the drivers one at a time. (You only need to do this for one speaker.) For information on how to measure a loudspeaker driver, please see the app note Loudspeaker measurement with UMIK-1 and REW. Then use the PEQ blocks on each output channel to shape the response of each driver so that it is flat over its operating range. Use "Peak" type filters to flatten peaks (with negative gain so they create a notch) and "High-Shelf" and "Low-Shelf" type filters to straighten out the overall response. Here is a graph of the tweeter, measured before and after correcting its response. When performing a tweeter measurement, start the sweep at a frequency so as not to strain the tweeter (e.g. start at 1 kHz, not 20 Hz). You will generally want to use the linking feature on the PEQ blocks to make the same settings for corresponding left and right speakers. With the example system, link channels 1 and 3, and 2 and 4. Open the crossover settings screen by clicking on the Xover button on the Outputs tab. For a two-way speaker, set a low pass filter on the woofer and a high pass filter on the tweeter. For a three-way speaker, the midrange driver will need both high pass and low pass filters. As a starting point, try using Linkwitz-Riley (LR) 24 dB/octave filters. You can then experiment with lower or higher slopes, from 6 dB/octave up to 48 dB/octave. Once that's all done, you can position the speakers in their proper positions, play music and listen to the results! You may wish to continue to experiment – for example, by trying a different crossover frequency or slopes. It is easy to do A-B auditions by setting up different configurations and switching between them with a remote control. If you have spare output channels, you may also want to consider using them for additional subwoofers and optimizing as described in our app note Optimizing multiple subwoofers with the DDRC-88BM and Multi-Sub Optimizer. Once that's all done perform perform your Dirac Live calibration as described in the User Manual (pdf). Then set up your bass management as described in the app note Bass management with the DDRC-88BM. Have fun, and let us know about your experiences in our forum.